Be honest. Is it filled with engagement? Or is it more like a forgotten directory listing? If you’re having trouble with your Facebook reach, I don’t blame you. It’s hard to get noticed on Facebook these days. With over 2 billion monthly users, 65 million small business pages and 4 million advertisers on its platform, it’s the biggest social media network on the planet. And you can bet it’s only going to get bigger. But with that growth comes the strain of change, including the latest algorithm update. In it, Facebook promised to show users the content they care most about. Problem is, as small business owners with a Facebook page, that’s not your content. So how can you get your page back on track? Below are 19 Facebook hacks that will breathe new life into your Facebook page. NAP stands for Name, Address, and Phone number. 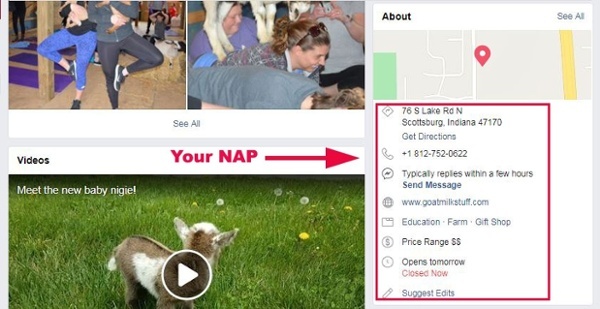 If you’ve ever gotten your business listed online (and I sure hope you have) you probably had to submit your NAP to the directory. You have to do the same thing for your Facebook page, and it has to be consistent with all your other listings or your overall search ranking will suffer. Make sure all numbers, spelling and abbreviations match. For those not familiar with SEO speak, long tail keywords simply refer to longer, more specific terms people use to find information. Though it’s usually not something you expect to be mentioned in a post about social media, it does matter. With each variation, I’m presented with different results. Notice how for each search the keywords are highlighted. To get found by the customers you want, you’ll have to make your page appear as relevant as possible to what they’re looking for. Get focused on what your customers search for, and the words they use when searching and then model your page and content after that. 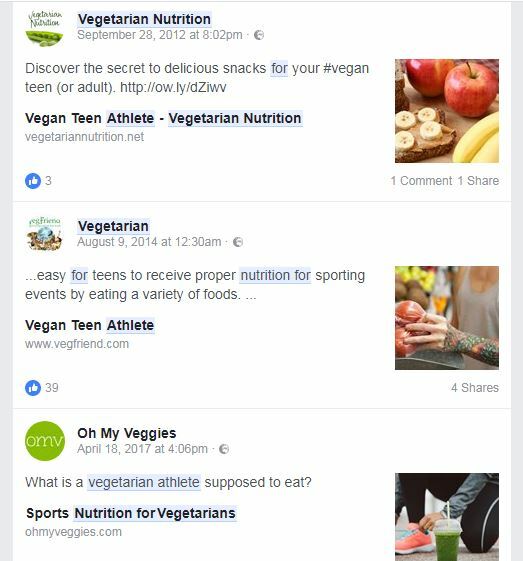 Going after specific longer search terms not only help you rank but it also ensures that your audience is extremely focused and is a perfect match for your business, this will boost conversion rates and engagement, which will in turn boost your Facebook page. Again we see similarities between your Facebook page and your website. 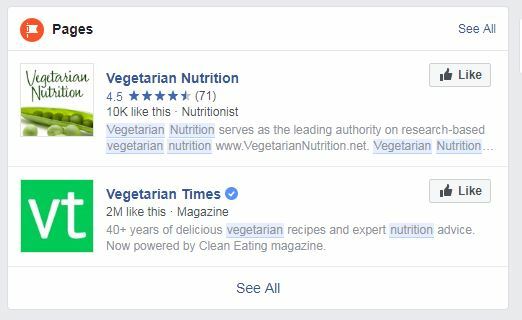 The more links pointing back to your Facebook page the higher it will rank for search terms. The easiest way to get backlinks for your page is to link to your Facebook page from your other channels, like your website, Twitter account, Youtube channel and even in your bio. 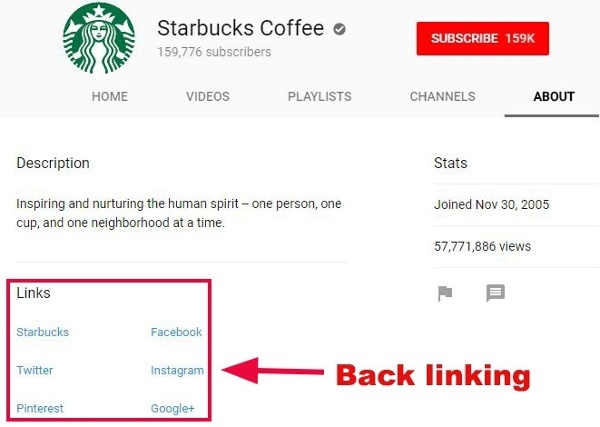 Important note: Starbucks backlinks to all of its accounts from YouTube. You already know reviews boost credibility, trust and sales. In fact, according to Bright Local, 85% of consumers trust online reviews as much as personal recommendations, and consumers read an average of 7 reviews before trusting a business. 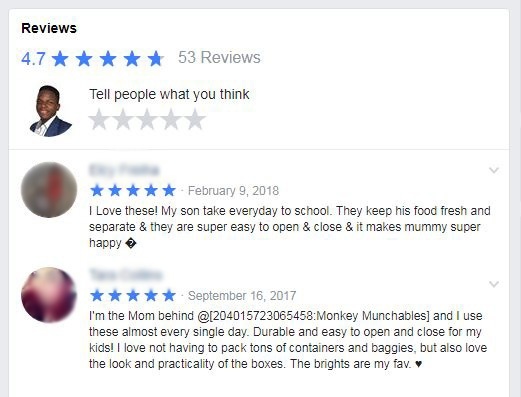 The importance of reviews doesn’t stop there. They also increase your page’s chances of appearing in search results on Google and Facebook. So start prioritizing reviews, because believe it or not, they’re not hard to get. The same study by Bright Local revealed that 68% of consumers will give a local business review when asked. We learn better from visual content and it sticks in our memory. But the real kicker is that visual content is 40X more likely to get shared on social media than other types of content. Your cover photo is the first thing your page visitors will see. Remember, first impressions are everything. Try to not use stock images. Select images that are in line with your company and its values. Let the visitor know what you’re about right from the start. 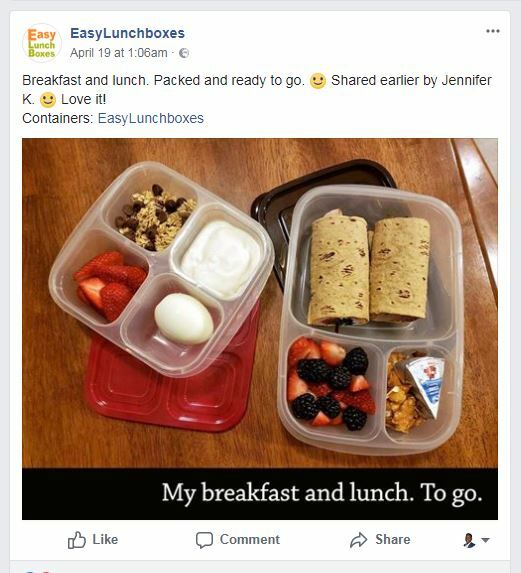 Kelly Lester of easy lunch boxes manages to show both authenticity and relevance on her page’s cover photo. 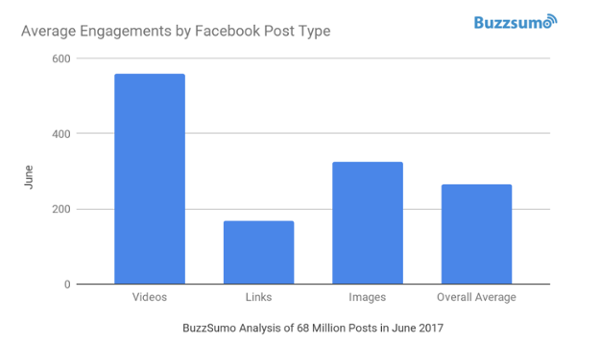 On Facebook, posts with images have 2.3x more engagement than those without, and it’s by far the easiest way to increase the share-ability of your posts. Remember what I said about visual content and engagement? Posting without images isn’t an option anymore. 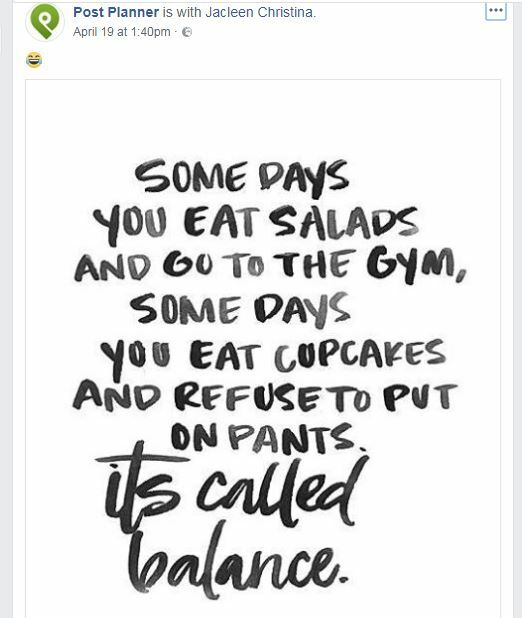 Just look at this post from Easy Lunch Boxes. One way to get free publicity is to tell your audience to add tags to your live event photos. Since we value recommendations from our friends better than any other medium, this is one step that can really give you a winning edge. 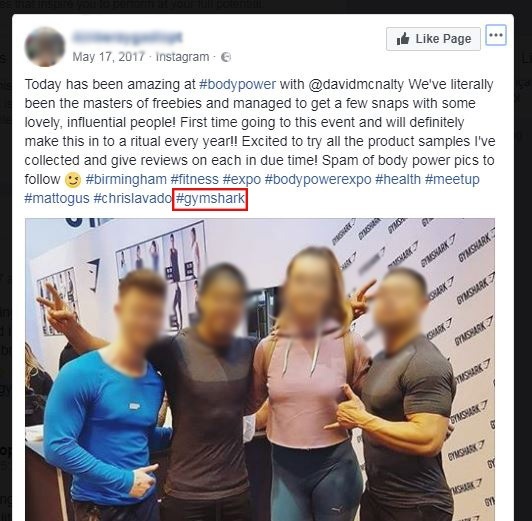 Gym sharks show how you can get customers to boost an event. Following the same advantage of visual content, if a picture tells a thousand words, then videos are a thousand times better. Facebook averaged over 8 million video views daily, and that was in 2015. Facebook’s algorithm now prioritizes videos over other types of content. Their native videos, as a result, have 135% greater organic reach than photo posts. Facebook’s clearly pushing videos, they’re even paying influencers and celebrities to post live videos on their platform. Buzzsumo created a graph that shows engagement based on content type. This is Facebook’s attempt to compete with YouTube as the premier video platform. If you’re not publishing videos you’re missing out on huge reach. I’ve told you that images perform better than text and that videos perform better than images. Well, live videos perform better than them all. And according to Facebook, people watch live videos 3x longer than regular videos and they comment 10x more. Facebook live videos can really get you to click with your audience, show originality, openness, and build a stronger customer base. Not to mention Facebook will give them a larger organic boost than any other type of content. When you post is just as important as what you post. Sometimes it’s not that your content isn’t engaging enough, it’s that you’re simply not posting at the right time. Your audience isn’t waiting around for your next update, they have their own lives, they might be asleep or are simply too busy to engage. There are a lot of recommendations for the best time to publish a post. But their audience is not your audience. The only way to know the best time to publish a post is to check your page insights. Then study how content is interacted with at different times of the day. You’ll be presented with data on the time most of your audience are online and even their most active days. Notice when your content does best and publish at those times. How much content should you publish a day? Generally the more content you post the lower your engagement will be. Most experts recommend only 3 posts a day so you don’t overwhelm your audience. But you can always run a test yourself, and then study your page insights data to find out how content is interacted with based on how much you post. If posting more is dragging down engagement, cut it out, if your response is even, you can leave it alone. Remember that your page engagement is your number one priority. Once you’ve got frequency and timing down you’ve got to be consistent so your audience knows what to expect. You can schedule posts at these optimal times with Post Planner. Here’s a simple guide on scheduling posts with Post Planner. If you read the intro to this post you must know by now that simply posting great content is not enough. Organic reach, even with video is simply too low to sustain a page. Your content will need a boost from time to time. Good content and paid promotion go hand in hand on Facebook. Good content engages and keeps your audience, promotion helps you reach them. 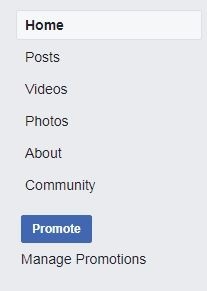 Facebook really makes this easy to do, there’s always a promote button next to your page options. The organic reach of your Facebook posts will increase the more your audience interacts with it. Because Facebook, like any good platform, is focused on providing its users with relevant content. 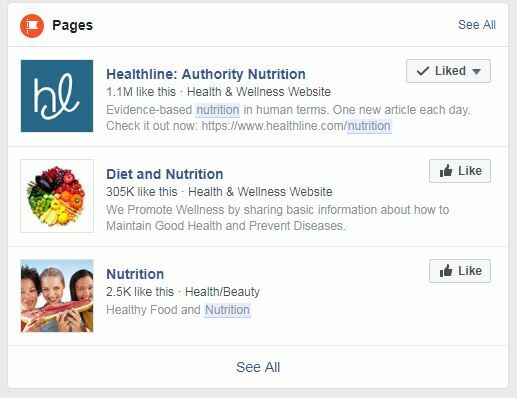 So if your audience likes, comments, and shares your post, Facebook predicts more of them will like it and you get an organic boost. The best thing you can do is capitalize on that and give a post with good engagement a paid boost. 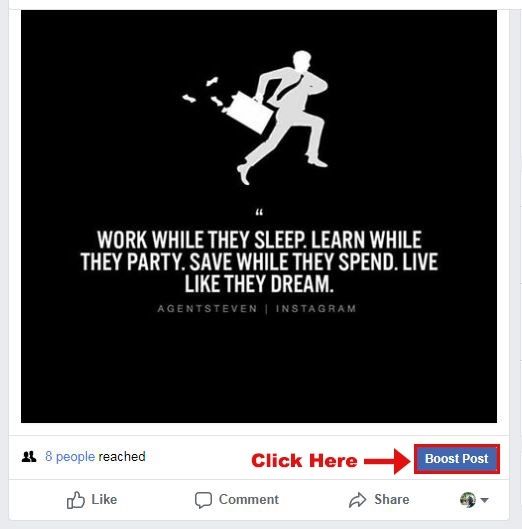 To promote a page just click on the Boost post button on your post. Then you have the option to select an audience or even add a CTA that’ll direct people who click on your Ad to a page on your website. 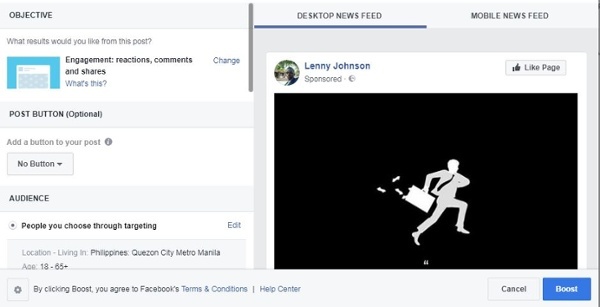 Simply set up your Ad and click the Boost button to start promoting a post. One of the more advanced and useful features of Facebook Ads platform is it’s retargeting feature. How do you reach people coming to your website but don’t give you their email address? Simple, you use Facebook retargeting. This feature allows you to show relevant Ads to people who have visited your website. This happens automatically and all you have to do is install Facebook pixel on your website. You can read more about installing pixels here, but here’s an image of how retargeting works. With pixel set up you can now promote your page or Ad to people who have already visited your website. This way they become more familiar with your brand and when they want to buy they’ll come to you. This is something I wish I knew about when I started advertising on Facebook. 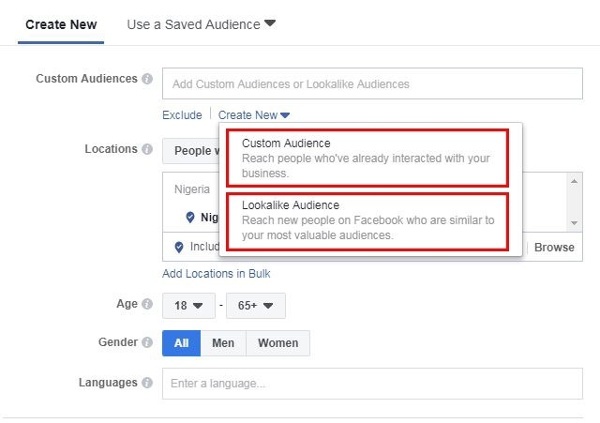 The custom audience feature lets you use the information you already have on your customers (e.g. their email address or phone number) to reach them on Facebook. This is just like retargeting but your custom audience consists of people who’ve shown a real interest in your business or are already customers. Custom audience let you keep the relationship going. Lookalike Audience’s are an excellent way to grow your Facebook influence. With it, you can reach people on Facebook that share similar interests or backgrounds with your current custom audience. It’s a great way to grow a targeted audience base because the people you’ll reach will share a lot of similarities to your current customers. Another way to increase user engagement and brand loyalty is to hold a contest on your Facebook page. Though Facebook does have certain guidelines, the benefits of staging a contest can’t be overstated. They engage your customers, form stronger bonds, and even offer free publicity. 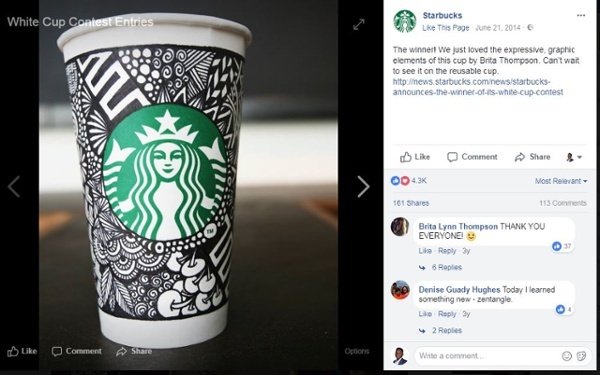 Remember the Starbucks white cup contest? Yet you’d be surprised by the number of pages that do anything but provide value. Your Facebook page is not a platform for you to sell your products. 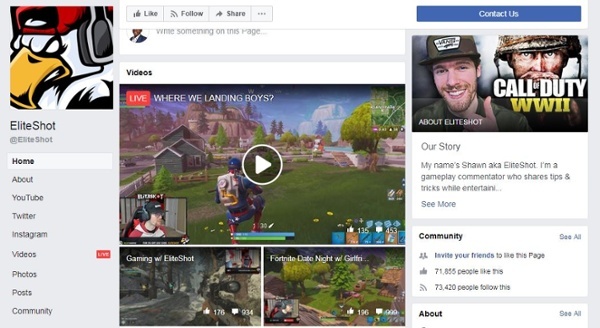 Your Facebook page should be about building trust and a connected community. This doesn’t mean you should never promote content, it just means that you should focus more on your audience’s needs and solve their problems rather than profiting. Content on your Facebook page should be 80% engagement material and 20% promotional. You should strive to be helpful, useful, and valuable. Yep, we don’t just preach it. Funny right? And it’s in no way promotional. 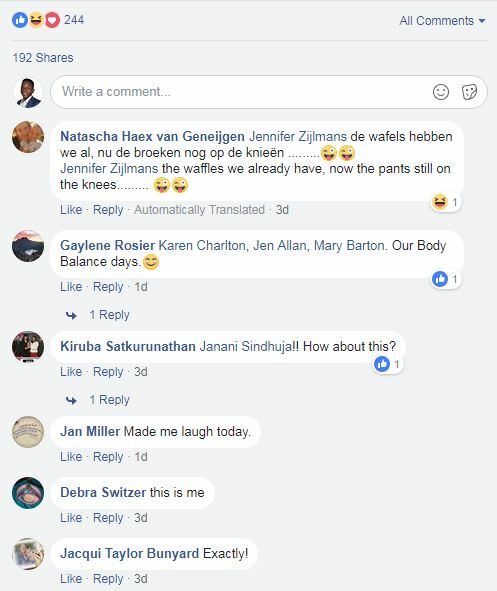 Now just look at the engagement for this post. Have fun with your customers, teach them something, help them solve a problem not related to your business. Facebook is too big for you to ignore anymore. Yet in order to benefit from it, you’ll have to plan, put in the effort, and invest where required to make it work. You don’t have to be salesy, just optimize your page so people and search engines know what you’re about, help and delight your customers. That’s the only way Facebook works. Do you have a Facebook page hack that’s given you awesome results? I’d love to hear about it.